Psoriasis is a skin condition which shows up as a rash with dry, silvery, scaling patches, and can flare up for no apparent reason. The affected areas often crack and are sometimes painful. Psoriasis is found mainly on the elbows, knees, scalp, chest and trunk, and can also affect the toenails and fingernails. It may begin in late childhood or young adulthood and usually continues throughout life. The cause of psoriasis is currently unknown, but several studies have linked it to an autoimmune disorder. Hereditary may be a factor since many people have a family history of psoriasis. Other aggravating factors include trauma to the skin and emotional stress. Psoriasis can usually be controlled, but not cured. Topical steroids are the first lines of treatment to control inflammation. Combination therapies using topical steroids and Vitamin D or Vitamin A prescription creams provide more relief from the symptoms of psoriasis. 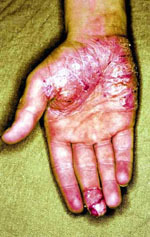 Tar is another topical medicine used to treat psoriasis. Tars are used in shampoos for scalp psoriasis and tar oil can be added to a bath for soaking the whole skin area. Tar preparations applied directly to the infected area at bedtime is most effective. Various oral medications are available for severe psoriasis. These include methotrexate, acetretin, and cyclosporine. Side effects exist for each of these medicines and our professional staff will advise of the potential risks before beginning one of these treatments. Ultraviolet light therapy (UVB) has been shown to improve psoriasis. Occasionally UVA light may be used. It can be used alone or in conjunction with topical steroids or tar therapy. The latest treatments consist of "biologic modifiers", products such as Enbrel, Remicaide, and Amevive. These immunologically engineered products are taken either through injection or intravenously with minimal side effects or risks. They have been specifically formulated for autoimmune-type diseases such as psoriasis and rheumatoid arthritis.